I spent a pleasant Saturday morning with my grandchildren while we had opportunity to listen to a reading of “Amazing Matilda” by Bette Stevens. In the end we downloaded the eBook as well. I can really recommend this little gem, not just for younger readers, but even older ones like myself who care about the natural world around us and love to explore this world by means of stories such as this. Bette A. Stevens is a retired teacher, a wife, mother of two and grandmother of five. Stevens lives in Central Maine with her husband on their 37-acre farmstead where she enjoys writing, reading, gardening, walking and reveling in the beauty of nature. She advocates for children and childhood literacy and for monarch butterflies, an endangered species. Stevens’s children’s activity book, THE TANGRAM ZOO and WORD PUZZLES TOO!, was first published in 1997 by Windswept House Publishing, Mt. Desert, ME; a second edition was self-published by the author in 2012. 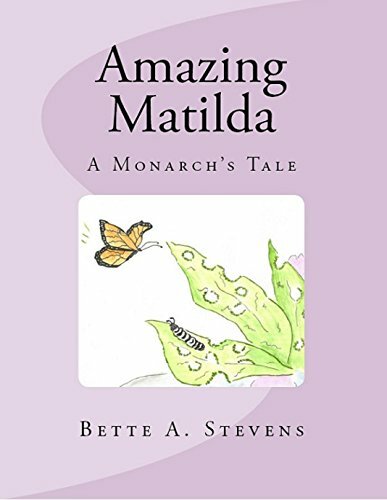 AMAZING MATILDA, Stevens’s second children’s book, self-published in 2012 won a 2013 Purple Dragonfly Book Award (Honorable Mention for Excellence in Children’s Literature – Ages 6 and older category) and also placed #9 on The 2013 Gittle List for Self-published Children’s Picture Books. Stevens has written articles for ECHOES, The Northern Maine Journal of Rural Culture based in Caribou, Maine. In 2013, the author published her first book for the YA/Adult audience: PURE TRASH: The story, a short story of a boy growing up in rural New England in a family whose poverty and alcoholism mark him as a target for bullying by young and old alike. This short story is a prequel to Stevens’s debut novel planned for release in the summer of 2014. Thank you for visiting my blog today. 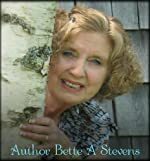 Why not pop over to Bette A. Stevens’ Author Page and see more about this fabulous author! If you would like to comment on this post, please do so beyond the ABOUT ME page. Thanks so much for listening, reading, reviewing and downloading a copy of Amazing Matilda and having a book talk with your grands. Just a quick note to let you know that the monarch’s poison is not lethal, but merely a warning (making them sick) to predators to stay away. Also the golden orange color of the caterpillars’ stripes and butterfly wings signal predators to find other prey. So glad that you picked up on that. I use the relationship between Sparrow and Matilda as a discussion point (birds eating insects) when reading to children and so happy to discover that you did too! Your lovely review made my day. Lovely review. My Grandson is a little too young to read it to just yet (Age 4) although he is fascinated by Butterflies or ‘flutterbies’ as he calls them. However my daughter and I are compiling a ‘library’ of books sharing life lessons in the way ‘Amazing Matilda’ does. I think that the discussion points about predators and the warnings that certain species give them to ‘stay away’ are intensely valid. This book in now on our list. Of course grandma has the pleasure of reading it first.